Camping using a tarp tent or shelter is definitely roughing it. For one it is open to bugs. People use them because they are light and convenient as a backpacking tent. They can set them up by typing them to trees, which means taking rope or cord along with stakes. Some people set them up using their hiking, ski, or trekking poles, or some other make shift pole. So you don't have to worry whether or not there will be trees available. I guess they are great for those who like DIY activities. Seems to be man thing. 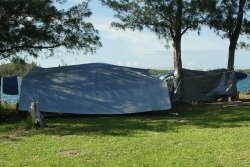 I mainly use tarp shelters to cover my tent, if I think I need extra protection from wind and or rain. Or for my kitchen area. If you need some tips on setting up a tarp tent or shelter check out the videos below. A tarp shelter is great if you want a cheap tent, just watch those grommets. However you can repair them or reinforce them with Duct tape. My method is to cover the grommet on both sides with Duct tape and punch a hole through. If you can afford to spend more for a shelter you might as well buy a lightweight tent, since they can be lighter than the equipment needed for a tarp shelter or tent.